Working from home is highly sought after by many people from stay-at-home moms to those wanting to earn extra income. One of the more unique ways to work from home is to teach English online from home. Teaching ESL online allows you to have location independence and work on your own schedule. 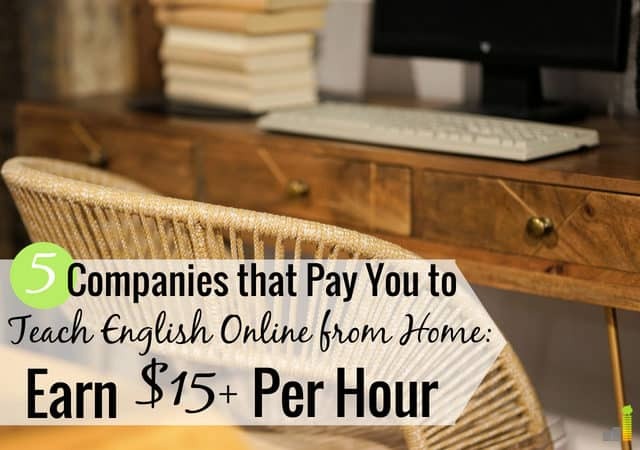 I see people talk about other legitimate work-from-home jobs like home-based customer service jobs or freelancing, but teaching English online can be just as lucrative. If you enjoy instructing and helping others, want a location independent job, are fluent in English, or looking for one of the best side jobs for teachers, you can teach English online from home and often make $20+ per hour doing it. If you’re looking to teach English online, read on for a list of companies you can work for along with some requirements to get started. A common misconception is that you need to provide your own curriculum and lesson plans if you want to teach ESL online from home. Thankfully, that is not the case in most situations. Most companies will have their own curriculum and lesson plans. Since you’ll be working with students all around the world, you may have to be available to work at odd hours to accommodate the students’ schedules. When it comes to choosing which company might be best for you, you have many options that pay good money. In fact, Glassdoor reports the average salary for an online ESL teacher is over $45,000 per year! VIP KID is a popular teaching site that offers an American elementary education experience to Chinese students ranging from four to 12 years old. Teachers can earn $14 – $22 per hour, are able to set their own hours and work as little or as often as they like. The great thing about VIP Kid is that they have already have a quality platform and provide all the resources you need, including lesson plans. They also do the communicating with parents. To teach for VIP Kid, all you need is a computer with an HD external camera or integrated camera, a headset and microphone, and the passion and skills for teaching. You do need to have a bachelor’s degree and one year of teaching experience. This experience does not have to be traditional classroom teaching. If you have experience tutoring or homeschooling, you can qualify to get paid to teach English online with VIP Kid. 51 Talk, otherwise known as HAWO American Academy is one of the older companies on our list. HAWO American Academy began in 2011 and lets you teach English online to Chinese students. What we like about 51 Talk is you teach students on a one-on-one basis. This allows for focused teaching for the student instead of a group setting. 51 Talk pays just over $7 per 25 minute session, allowing you to earn slightly over $15 per hour. They do also offer a bonus structure, allowing you to increase earnings to over $22 per hour. EF Education First is one of the oldest companies on our list, having started in 1965. The company operates in over 100 countries and has near 50,000 teachers and staff across the world. What makes EF a little more unique is you can teach both students and adults. You can also choose to teach in one-on-one, or in a group setting. EF Education First allows you to set your own schedule. They have class times of varying length, from 30 minute sessions to a full-hour class setting. You can expect to make $12 – $19 per hour with the platform and they pay monthly, via PayPal. GoGoKid is a newer company and run by the same company as VIP Kid. Being a newer company, GoGoKid does not tout the same student base as other companies. To make up for that, GoGoKid is one of the higher paying companies to teach English from home. GoGoKid focuses on younger students, with most students in their teen years or below. Like 51 Talk GoGoKid classes are one-on-one, allowing you to focus on one student at a time. Taking short surveys in your free time can be an awesome way to earn extra money fast! The instant you finish a survey, Survey Junkie pays you in cash via PayPal. 6 Million users and an 8.9/10 Trust Pilot rating prove you can trust them. GoGoKid also has a unique credit scoring system for teachers. You gain credits for teaching, getting good reviews, and being fully booked. You lose credits by not teaching a whole week, having IT problems, or by not showing up to teach an agreed upon class. Including bonuses you can make up to $25 per hour teaching with GoGoKid. You can also earn 125 percent of your pay once you reach a high enough credit balance. Cambly is one of the more flexible options to help people learn how to speak English fluently online. Most of the other companies that pay to teach English online from home require some sort of teaching certification to start. That is not the case with Cambly. You simply need to be fluent in English and have a webcam attached to your computer. Another thing that sets Cambly apart is you can have students from all over the world. You may have a student from China, or one from Brazil. Cambly lets you teach English from home by having live conversations with students. When you sign into the platform you’ll see the available students waiting to talk and you get to choose which students you want to take. They may just want to chat for a few minutes, or have an in-depth conversation. You chat with them during these conversations to help them improve their English skills. You can also sign up for priority hours where students contact you directly, via webcam, to have a conversation. Cambly pays $.17 per minute of talking, which works out to $10.20 per hour. You can work on a shift-based schedule, or just work a certain number of hours per week. Cambly pays via PayPal twice a month, assuming you have a $20 balance, on the 1st and 15th. 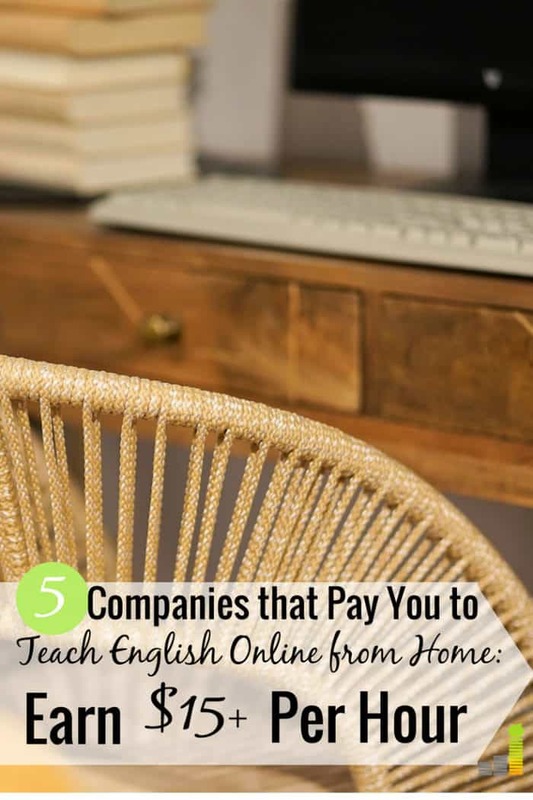 These are just some of the best sites that will pay you to teach English online from home. Most opportunities are flexible to accommodate your schedule and needs. This is one of the best jobs for stay-at-home moms and those simply wanting a way to make extra money. Remember if you have credentials, you can expect to earn more money. You should even consider checking job boards like Indeed and FlexJobs to compare opportunities. What are some other companies that let you teach English online from home? What are other unique work-from-home jobs have you done that pay good money? How much must a work-from-home opportunity pay for you to consider it?